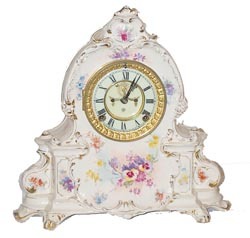 Ansonia Clock Co. Royal Bonn case, "La Manche", ca 1904. This is a clean porcelain case, primarily a cream color with gold accents; flowers are purple, yellow, pinks, blue, all over the case except the back. 8 day, gong strike. It has a good French sash and beveled glass, as well as a nice 2 piece porcelain dial with open escape. There is 1 small hairline. They must have made these dials with hairlines. This is a large case, 14 inches high, 14 inches wide. Very attractive, clean clock, right out of the display case, near perfect. Ly-Ansonia No.2618.